This morning we drug ourselves out of bed very early, sped around the house, then got on the road quickly to meet our friend at his coastal place. 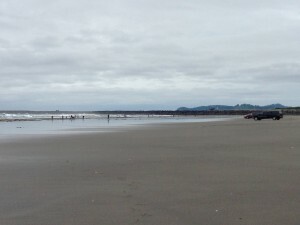 Once we switched everything over to his truck, then we headed for the beach and yet more adventures in razor clam digging near the mouth of the Columbia River. 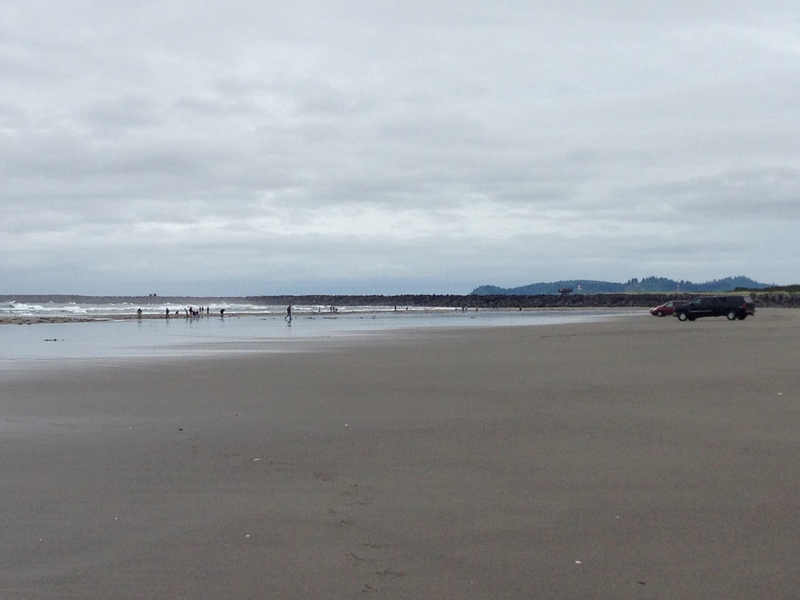 DH commented that this is the most often he’s gone by the wreck of the Peter Iredale ever…same for me as well. At first the digging was slow. After initially getting a smaller clam, I hit quite a few dry holes. Then I followed our friend over to a spot on the beach which was just packed with big clams. 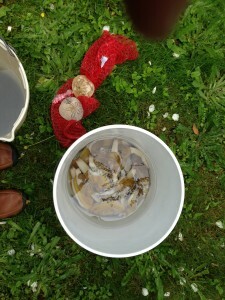 DH joined us and we managed to get a limit for all three of us–45 clams–in less than an hour. It was nothing-nothing-nothing–then hey, look at that! and we were digging hard and fast, twisting the clam guns into the sand quickly yet delicately. Oh, and I found two whole sand dollars. I’ve never found whole sand dollars on the beach before, so that was really cool–and they’re nicely marked. There were a lot of tiny little crabs on the beach this time. I saw a couple of things that might have been tsunami debris, but they might not have been, either. Spotted a big freighter working its way across the Columbia River Bar and another one headed out. There did seem to be a bit of traffic on the river for certain. A fascinating thing happened when I was rinsing my clams for the last time. As I pulled them out of my bag, one of the clams extended heshe’s foot. While a clam’s foot is webbed, the edges are a bit stiffer and can dig. Well, this clam waved its foot aggressively, grabbing at the sand for three attempts to dig in, then pulled it back in. We stopped at the Pig-n-Pancake in Astoria for breakfast. They have heavenly gluten-free pancakes, so I pigged out on blueberry pancakes, bacon, and a half-slice of ham. Hey, after doing all that clam digging, girl’s gotta carbo load, y’know. Wet sand is pretty dang heavy. There were a lot of big clams this time around, many more than from the past two times we’ve gone out this clam season. And we’re starting to get the hang of how to dig razors without breaking the shell. That said, it’s easy enough to break the shell even if you back off with the clam gun and go in by hand–the process of pulling the clam out can take a bit of work to get them without breaking the shell. 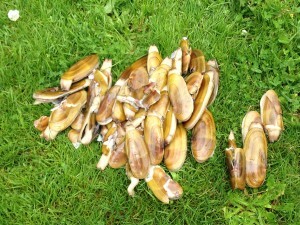 Nonetheless, we got a lot of nice clams today. It’s our last expedition of the season, because it closes in mid-July and there aren’t any good tides that match our schedule between now and then. It’s been a good first year digging these razor clams. I think I like it better than digging for the big blue or quahog clams. It’s easier digging clams in sand than in bay mud. We put our share of the clams away in the freezer, for a taste of early summer sometime this fall and winter. That batch will be enough for clam fritters and clam chowder. November or December…mmm. A chance to remember a perfect clam day. Comments Off on Clams again!